One of the main components of our Real Agility Program for enterprise Agile transformations is the Leadership Development track. This track is a series of monthly leadership meetings with one of our consultants to help them establish their Leadership Transformation Team. This team is based in part on the concept of a guiding coalition from John Kotter’s work (see “Leading Change“), and in part on Edgar Schein’s work on corporate culture (see “The Corporate Culture Survival Guide“) as well as our own specific experience on successful Agile transformations in organizations. In total, the number of people on this team should be no more than 12, but smaller is better. Urgency and Vision: constant, strong, repetitive, prominent communication of the reasons for change and a high level view of how those changes will happen. Lead by Example: use of an Agile approach to run the Leadership Transformation Team’s work – we recommend OpenAgile for the process, but Kanban may also be used. Empower Staff: focus on removing obstacles by making structural changes in the organization, helping staff master standard Agile processes and tools, and eventually, creating innovative Agile approaches customized for the organization. Many of these items are multi-year change efforts that need to be closely guided and encouraged by the Leadership Transformation Team. One final point about the Leadership Transformation Team needs to be made: the work they do must not be delegated to subordinates. If something is part of their three core responsibilities, it must be handled directly by the members of this team. Therefore, the team members need to allocate a significant percentage of their time to the effort. Usually 20% is sufficient to get started. The proportion may wax and wane slightly over time, but if it gets too low, the Leadership Transformation Team will lose touch with the transformation and the risk of it going bad increases substantially. See also our article about the Recommendations component of the Real Agility Program. Based on the way the SAFe Big Picture looked to me, I walked into that class very concerned that SAFe would take away the teams’ creativity by “pre-chewing” the stories into requirements a la my project management days. I thought I might see the rebirth of “The system shall…” statements. I was also worried that SAFe would take away teams’ autonomy and reverse our still fragile belief in emergence; the diagram just looks so top down! These concerns put me on alert for anything that appeared to undermine the Agile Manifesto or the Scrum values. A surprising thing happened in that class….. SAFe will be successful in the market. People will benefit. They just won’t benefit nearly as much as they might if they set out to do things in a fashion that truly supports Agile Values and Principles. SAFe is good. It’s just not good enough. It provides some benefit, but endangers an organization’s progress toward really high functioning. As someone who has been in the Agile movement since before it started, I do not like it. It’s fast food. You can do better. I don’t think “agile at scale” is a bad word. I’ve consistently maintained that projects should be as agile as they can be but no more. A project that requires let’s say 500 people will never be as agile as one that requires 3 people. But I can’t imagine the 500 people and 3 people being competitors. And, if they are, the bigger mistake made by the 500 person project is involving the other 497 people, not the process they choose. So you can go the SAFe path or the Scrum and Agile path. All you need to do i[s] figure out how big a cliff you want to deal with down the road. I don’t personally have any experience with SAFe so I won’t make any big claims about it either way. However, I do appreciate that the popularity of SAFe, like the popularity of Agile/Scrum* will probably lead to studies showing modest qualitative improvements of 20% to 40% increases in productivity. Is this just the Hawthorn Effect at work? When I help an organization with Agile principles and methods, I hope and expect dramatic measurable improvements. Sometimes this results in people losing their jobs. Sometimes this means people have nervous breakdowns. It can be very painful in the short term. SAFe, by it’s very name, seems to be anti-pain. That doesn’t bode well. * There is no such thing as “Agile/Scrum” but that’s what lots of people call Scrum when they don’t do Scrum properly. In an Agile culture, it is considered rude to refer to people as “resources”. People are not fungible – you cannot just take any old developer and plug them into any old project. Skills, personalities, likes, talents, potential all are so dynamic and unique for each individual person. So any management theory (including traditional project management) that treats people as “resources” like oil, gold or computers, is making an unjust simplification at the expense of the people working in the organization. Yet organizations need to be able to plan where to spend money, and certainly the people working in an organization are often one of the largest costs. From a financial perspective, from a business perspective, it makes sense to somehow treat people costs in the same way as other operational costs… and this often leads to dehumanizing people to the point of treating them like resources. So how can these legitimate organizational needs for budgeting mesh with the equally legitimate approach of Agile to treating people as unique actors be merged? It is actually quite simple, but the ramifications are deep: treat TEAMS as resources. Teams become the fundamental building blocks of an organization. Teams move from project to project or program to program or operation to operation. There is still a need to support the individuals in an organization, but it is done in the context of teams. An Agile team is cross-functional, but also constantly learning. Individuals on the team learn skills based on their own interest, but also based on the needs of the team for redundancy, parallelism, and expansion of capacity to take on new, more challenging work. Cross-functional teams can more easily (and more sanely) be compared for their value to the organization by looking at things such as their ability to produce finished product/services, their flexibility in serving the needs of the organization, and the quality/consistency of the work they produce. Teams can compete in a healthy way by striving for excellence in delivering value to the organization, whereas often competition between individuals can be quite unhealthy. From a budget perspective, teams are easy to manage: each team has a fully loaded cost based on salaries, space, equipment, etc. The cost is (or can be) relatively stable or grow predictably, and can still be handled operationally. As well, unlike individuals, it is much easier to treat a whole team as a fungible unit: you feed work to teams based on their availability rather than based on a detailed analysis of their skills/capacities/allocations. 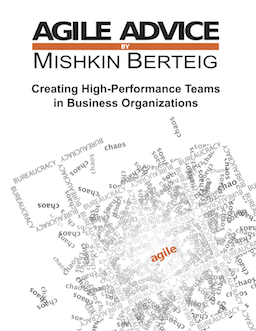 In Agile organizations, teams are resources, people are not.